Road noise can be controlled by placing soundproofing mat on the firewall and Flooring Mat on the floorboards, good coverage is essential. Mat can be cut into squares and heated with a heat gun to help it conform to unusual shapes. Some pretty expensive mat is available from some auto paint wholesalers called Dynamat. Contact cement will hold it permanently in place. (Be sure its waterproof cement!). The walls and roof should receive the treatment if practicable. Our Super Soundproofing Mat is better for this as it comes in one piece instead of 12? squares. Voids (open) areas can be closed up with expanding foam that is sold in cans. This will cut down on an echoing effect. 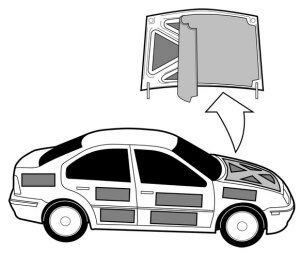 Be sure to do the trunk area as it will tend to resonate like a drum into the passenger compartment from road noise. (Volvos are notorious for this.) “Cadillac” quality comes from lots of soundproofing material and attention to details of covering every square inch with material. Long distance truckers can really benefit from soundproofing their cabs and sleepers and heavy equipment operators will find fatigue greatly reduced as their noisy environment is quieted! Again, a side benefit is the reduction of heat and cold. Most noise is generated by the engine and carefully covering the engine compartment with soundproofing mat will do a marvelous job of sound reduction. Soundproofing the engine room walls and ceiling are most important in larger boats (ships), and hanging mats often can often be very effective. More about that in the next section! Usually it’s the engine and/or generator compartment. Treat this in the same way as the engine in a truck or car-line it with soundproofing foam.